Patent disputes do not just occur over drugs or electronics. In fact, even the pencil, a simple product used by millions everyday, was at one time part of a court battle. The first patent for attaching an eraser to a pencil was issued in 1858 to a man from Philadelphia, Pennsylvania. 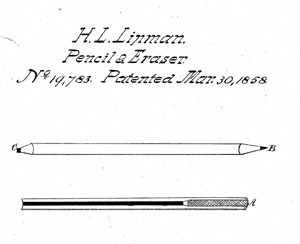 Hyman Lipman received patent number 19,783 on March 30, 1858 for a Combination of Lead-Pencil and Eraser. Lipman sold his patent to Joseph Reckendorfer in 1862 for one hundred thousand dollars. On November 4, 1862, Reckendorfer received patent 36,854 for an improvement in pencils. Reckendorfer, armed with his two patents, sued pencil manufacturer Faber-Castel for patent infringement. This lawsuit did not end well for Reckendorfer. In 1875, the Supreme Court of the United States ruled against Reckendorfer in Reckendorfer v. Faber. The patent for a pencil with an attached eraser was consider invalid. According to the Supreme court decision the patent was invalid because the two parts; pencil and eraser were used no differently when combined then when used separately. A combination, to be patentable, must produce a different force, effect, or result in the combined forces or processes from that given by their separate parts. There must be a new result produced by their union; otherwise it is only an aggregation of separate elements. A combination, therefore, which consists only of the application of a piece of rubber to one end of the same piece of wood which makes a lead pencil is not patentable. ← Invention Geek – Shortest Patent Application?